Madhyamik Letter Writing is very scorable portion to score maximum marks in West Bengal Madhyamik Exam. Write a letter to the editor of an English daily newspaper about your concern to demotivate the youngsters from playing ‘Blue Whale Online Game’ such a suicide game. Sub: Don’t Play Blue Whale Game. I, hereby undersigned person, want to ventilate through your esteemed daily newspaper about the problem of recent social issue of playing Blue Whale online game amoung the youngsters. At present in our country it is bitter and very hard problem because Blue Whale game leads school students, college students, specially youngsters to immature death. They have no such carefulness about the harmful effects of Blue Whale game. They impressed very much to play such a suicide game through social media. The Blue Whale game is an online game in which the participant is chases a social media account, which instruct them to complete 50 days challenges. The Challenges rise in their extreme starting with watching a horror movie or doing others harmful activities. As the result of it, numerous youngsters face to death around the whole world. In India, A 14-year-old boy jumped off from the seventh floor of a building in Mumbai. Ankan Dey, a 15 year old teenager from Paschim Medinipur, West Bengal, commits suicide in the bathroom of his house. So everyone should be aware of the game and save the life of their sons or daughters. Therefore, it is my heartiest request you to publish the above note and inform the public and the authority sharply. 1. Write a letter to your younger brother advising him not to play ‘Blue Whale’ online game because it is a suicide game you know. 2. Practice an UNSEEN PASSAGE on BLUE WHALE game. 3. 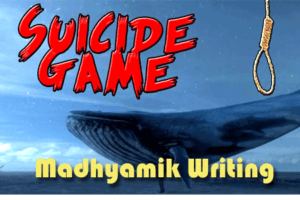 Write a report on “how does Blue Whale game force the young girls and boys to sacrifice their lives”. Please share this writing to your friends to help them for nearly examination.